Early rough sketches were made around 1995 and progressed to full size 3/8"-1' drawings in 1996. Using the profiles developed, models and mock ups of possible interior configurations were built. In 1998, having settled on the basic design and direction, some of these sketches were furnished to a prominent naval architect for comment and opinion, paying for and receiving a variety of interpretations using both his styling ideas, my suggestions and original sketches. After a period of time I elected to continue development alone. I soon had the good fortune to hear of a very talented young designer who thought outside the box of conventional styling and design. Typically, Naval architecture follows fairly well trodden paths of development which assures you that you will receive a pretty generic evolution or copy. This young and talented naval architect was Douglas Zurn from Marblehead, Massachusetts. Initial talks revealed a bright mind with an eye for details, necessary criteria for the selected designer. We went to work together and jointly designed one of the world's most beautiful yachts. At the same time I continued to refine the concept of the proprietary underwater profiles and lines on the various models built. After each modification they were tested and compared. Doug Zurn and David Marlow share design credits for the Marlow Explorer 57C, 61C and 65C. We visited and discussed the parameters with the top builders in the world of yachting over several years. We traveled from New Zealand to Nova Scotia, Singapore to Siam and Canada to China. We examined every aspect of the building process with an open mind. There were no sacred cows and we began each subject with a clean sheet of paper. We found a great deal of room for improvement in virtually every area. We found archaic methods, materials and implementation. Except within certain custom building companies (less than 1% of the boat manufacturing companies) there was a great deal of room for improvement. We found that many production boat companies routinely compromised already marginal standards of construction, purchasing and quality control. We found that some would spend an extra 15% in purchasing costs due to a weak financial position, poor planning or poor resources. At the same time some would reduce the quality level of basic foundation components, like resins, to save 5%. These choices invariably come with a cost to the customer. It may be blisters in a couple of years, stress cracking or faded, lackluster gelcoat. We vowed to build strictly to top world standards and adhere to the strict requirements of standards organizations like ISO (International Standards Organization) and Det Norske Veritas. We determined not to use yesterday's technologies for tomorrow's products. Utilizing our strong financial position, we negotiated from the most advantageous position to procure only top level products for use in the Marlow Explorer series. Instead of trading away advantageous pricing for credit terms, we negotiated the absolute best terms on the basis favored by the manufacturer of the product. Kevlar was chosen for hull fabrics because it produces a hull that is many times more durable than common, old, low technology off-the-shelf fabrics. It also produces a hull that can withstand the punishment of rough seas and impact with floating objects. Kevlar is the chosen material for armor plating in the military and police forces. No common polyester resins will be used in a Marlow Explorer. History has shown they are more prone to osmotic blistering, have lower initial strength, (by a large margin) suffer from ultraviolet degradation if exposed and have numerous other shortcomings. One of their largest shortcomings to us was the fact that in Military specifications, they are not considered to be a high enough quality adhesive to obtain a rating. The resin is, after all, the glue that holds the fabrics together. The Marlow Explorer is built with Vinylester resins and in selected areas where suitable, epoxy. Both these resins hold a favored MILSPEC rating. When we receive our resin it is checked for specifications and then stored in a climate controlled room to insure it remains at maximum specification. We chose ATC Core-Cell for our sandwich construction when it became apparent ATC was a quality company with outstanding support and engineering. Laboratory destructive testing carried out by Sigma Laboratories provided independent data reflecting superior strength, impact absorption and numerous other benefits not available in competitive products. Our own independent tests verified that their product was outstanding. With their impressive engineering library we arrived at a laminate schedule of remarkable ultimate strength and an impressive weight to strength ratio. Marlow Yachts is a world leader in the exciting new technology of resin infusion. This technology literally infuses each fiber with precisely the right amount of resin while in the mold, with no room for human error in resin content. This is very important in that one drop of resin over the required amount to wet the fibers reduces the laminate strength. Our RIVAT© is simply the highest expression of this state of the art methodology. At the same time the exclusive closed molding process employed with RIVAT© (Resin Infused Vacuum Assisted Transfer) eliminates ozone depleting chemicals dispersion from the process. (See the full discussion of this process wiht photos). The panel stiffness of a laminate is dependent on the cube of its thickness hence a sandwich laminate will have much greater panel stiffness and therefore less flexing than a single skin laminate. This prolongs the life of the laminate, preventing stress cracks with far better resistance to water penetration of the laminate by any method including the nemesis, osmosis. The matched tooling built to produce the Marlow Explorer was specified to tolerance levels far lower than any normal industry standard. The tooling quality is what determines whether your new yacht's finish looks like fine porcelain, or has a lower quality exterior finish. Many manufacturers just add pieces of teak to hide these problem areas. Colored hulls are a standard option with Marlow Explorer. In fact we love them. Most manufacturers either try not to do them, charge a large premium or apologize for the poor finish when done. Look ours over with a magnifying glass. It's the best men and women can do. This carefully matched tooling also produces parts that fit the way they were designed. We don't think you should have to hammer, pry, curse or cajole parts to fit together smoothly. Yes, it costs a bit more up front, but it pays you back with interest on each and every operation afterward. Some well known companies spend up to 1000 man hours in rework time per boat due to poor quality tooling, fixtures and methods. The math shows that a little more patience and a bit more up front investment pays big dividends. In order to make sure all the parts for these yachts fit perfectly we built a complete 65' wooden boat model, with the exterior details complete. We then assembled the components to make sure they fit perfectly. Then, and only then did we proceed to build the master set of tooling that allows such a technologically advanced yacht. Many builders boast about the number of molds required to build their product. Our aim was a little higher. We chose to build very complex tooling that allows us to build the Marlow Explorer with a minimum number of pieces. You be the judge. Would you rather have a yacht built from three major molds like ours or one pieced together with 40-50 molds. We feel the less seams we have, the better the chances of our yachts remaining tight as a drum and leak free for decades to come. Experience and testing show that the retention of strength of a laminate will decrease dramatically with increased panel flexing. The more one allows a panel to flex the faster its properties will decline. This applies especially to the very brittle Ortho-Polyester. Most builders today use Ortho-Polyester in combination with E-glass woven roving and chopped strand mat. From an engineering point of view this combination represents a relatively low quality and low cost laminate. Some yards using this method are yards with a high quality image and a good reputation. , we have used from the beginning, unidirectional stitched fibers such as Kevlar and other specifically engineered fabrics in combination with SAN foam sandwich construction. Through the years we have developed our laminating systems and today the minimum requirement for any part of a hull laminate is Iso-Polyester. There is no Ortho resin allowed. Our standard boats have vacuum-bagged Modified Epoxy laminate using Corecel foam as sandwich material and a hybrid roving using Kevlar/glass unidirectional as basic fibers in the laminate. There is no question that a sensible high tech laminate will be stronger, lighter and last longer thus increasing the life and second hand value of a yacht making it a good investment in safety, comfort and reliability for the owner. The next area we looked closely at was who was currently capable of building to these standards. It became quickly obvious that a well made interior cabinet did not make a superior yacht elsewhere. A beautiful engine room alone did not insure the balance was of similar quality. We found several who did a good job on 25-50 and even 75% of the work that goes into making a fine yacht. Very few had it all together. Candidly, we found about four yards worldwide, who were already utilizing this level of technology and craftsmanship from top to bottom. We also found that they were already very busy with many fine yachts under construction and had no ability to add another project. Once again our decision to build the best and to advance the art paid dividends. Our production is completely within China at a wonderful, brand new facility specifically designed and built to construct our high technology yachts to top world class standards near Xiamen. This is the first "green" facility of its kind in China which was brought to the world's attention by the awarding of the prestigious Yachts International Environmental Award to Marlow Yachts Ltd. A new separate molding facility with climate control for storage of the exotic chemicals we use is completed and in daily operation. We have highly experienced, long term employees. Most of the masters have been there from the beginning. We have the proper facility, a large engineering staff and combined experience to build up to 100' yachts. We are a professional yacht building association holding virtually every prestigious title in manufacturing including ISO, DNV etc. Norsemen Shipbuilding is described and pictured on their own page. Please click here to read more of this advanced shipbuilding facility. The internal systems and strenuous crosschecks in place insure that we will receive the best product possible. Our quality control checklist alone lists 2,387 tasks to check. In our discussions with the many builders worldwide, we found that almost without exception, the builders who were content to build mediocre yachts preferred that we simply give them the plans, a deposit and pay for it when it was finished. They preferred that we did not maintain an in house resident engineer, naval architect and quality control person. On the other hand, the top builders saw that as tremendous benefit for both sides of the joint venture. So do we. We hired a very talented engineer who graduated with honors in naval architecture from The National Institute of Marine Technology. He is on site every day in our own engineering section and will check each and every item that goes into the yacht. He will check the materials for quality, proper storage, temperature, humidity and a host of other well defined parameters. Our factory supervisor Michael Huang is skilled at tool making, construction, mechanical, electrical and plumbing. Michael has established a quality control system second to none in its original scope. Michael is on the job every day in the factory overseeing every detail of every yacht produced - from the receipt and storage of materials to the detailed quality control checklist maintained on every job. 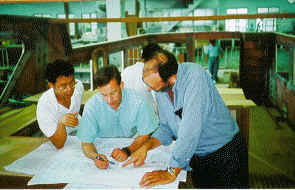 Michael Huang, Doug Zurn and David Marlow discussing the details of a yacht under construction. By advantageous materials purchasing for cash on delivery, directly from the original equipment manufacturer, we are able to save as much as 15% compared to common methods of purchasing. This also provides advantages for our building partner in cost reduction and inventory load. By purchasing in advance and utilizing bulk "space available" shipment methods rather than last minute emergency overnight deliveries, we save enormous amounts of freight which adds no value to the product. We search for and purchase only premium select hardwoods to build the artwork in cabinetry in the Marlow Explorer. The teak is Burmese select because it is the best. 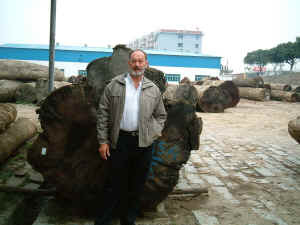 To the left is teak log ready to be milled. The cherry is Premium Select because the growth patterns in these hardwoods provide a much tighter grain pattern. Does it cost more? Yes. Is it worth it? Absolutely! Our resins are from the world's top supplier, fully tested and certified to meet our standards. After that we test every laminate for resin content and Barcol hardness at intervals. If it does not measure up, it won't ship out. This step not only insures we have achieved the design parameters, but also insures the finish on your Marlow Explorer will look like fine Porcelain for years to come. Our hull and superstructure laminating fabrics are engineered for the particular application and area to be used. One or two fabrics off the shelf simply will not allow the great strength we specify. The Dupont manufactured Kevlar we use is among the strongest materials in the world. The engineered laminates combined with the ATC CoreCel sandwich is produced under deep vacuum utilizing adhesives so strong that in destructive testing, they must be destroyed to pull them apart in small pieces. Even our bulkheads and floors are built of exotic fiberglass products to achieve maximum strength, sound reduction and interior volume. You will not find plywood walls, bulkheads or floors in a Marlow Explorer. The huge main salon floor for example is a precisely engineered and constructed one piece sandwich laminated under extreme vacuum. This allows us to span a length of over twenty feet with no supporting posts, 2x4s or other space robbing and heavy materials from yesterday. When you enter the beautifully laid out stand up engine room you will not find a single supporting post or space robbing beam supporting the floor above. We have been told our standards are the highest in the industry and our goal is to maintain those standards. During the development period we received advice from some very talented industrialists and entrepreneurs. One's advice has rung in our ears continuously. Reduce costs where you can by using your head and investing in machinery, but never reduce value! We have and will continue to follow this type of advice. By making a large up front investment in tooling and methodology, we save a multitude of man-hours in assembly because the parts simply fit better. We save many more hours of rework we don't have to do, and in warranty repairs that won't be necessary because we did it right the first time. The piano quality joinery and finish level you will find in a Marlow Explorer will stay that way for years and years. The end result is a world class line of yachts for about the same price as a garden variety production yacht. The material components for the Marlow Explorer reads like a "who's who" of quality manufacturing. Sub Zero, Caterpillar, Cummins, Northern Lights, Franke, Grohe, Schwepper, Ultraleather, Bosch, Asko, Cantaluppi, Besenzoni, Dacor, Wolf and other top brands. The floors you walk on will not be plywood with a thin veneer, built in a production shop but rather solid premium hardwoods selected, purchased, sawn, dressed and built by our own craftsmen. Natural stones like granite and marble will grace these fine yachts. The drinking water will not come from a huge tank of aluminum, fiberglass or iron. In fact it will be pumped from its own FDA approved food-grade gel-coated composite tanks with elaborate filtration. You can control the quality of the water in your glass and in your ice cubes. With this system your drinking water can always be monitored and controlled to avoid unpleasant reactions. We think your family's health is too important to drink aluminum oxide, fiberglass dust or parasites that may come from the water available. Water for other domestic uses will come from its own large capacity and separate top quality tank and heavy duty pump system . 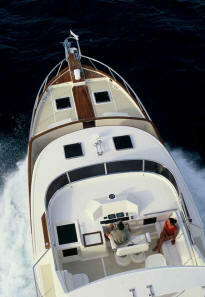 We have tried to think of and build in all the little features that make yachting such a pleasure. We have kept voluminous notes and records of the things that have aggravated and pleased us in over 40 years of voyaging on many of the oceans of the world. The things that work and the things that don't. Perhaps you don't feel you need this level of commitment to quality and enduring value. Won't it give you great comfort, though, when you are far from land to know we did our best in every way? Before any yacht leaves the factory it will have undergone the most extensive battery of tests we are able to devise. We have a "monsoon" shower that literally floods the yacht for hours with thousands of gallons of water on every part. We have a test tank to check trim and equipment function. Our weight calculations are so precise that we have not added a single pound of trim ballast to a single yacht. They float precisely as intended. We have a bending test to certify the structure and more than eight hours of actual testing on even the smallest component. Everything will be tested from the light bulbs onward, from keel to masthead light. Before you receive your Marlow Explorer, it will have approximately 30 hours of at sea testing time to insure everything works just the way it was intended to. We are justifiably proud of what we are producing. The first Marlow Explorer was a 65C and made her debut at the year 2001 Miami International Boat Show, to absolute rave revues. At each of the large boat shows since her debut, we have had overwhelming success and praise. Yachts International Magazine proclaimed her one of the finest yachts built. Comments heard on the docks ranged from "There is no need to look at another yacht" to "Never have I seen such a complete and well designed vessel". Numerous Yachting journals have rigorously tested and sea trialed these yachts with outstanding results. We have the various articles listed in the news and events page elsewhere in our website for your further information. If this type of yachting experience sounds appealing to you, we invite your sincere inquiry. We will build only a few Marlow Explorer yachts per year. Each one will be built for its owner with extensive owner input as to the layout. The experience will be richly rewarding for those we work with in making their dream a reality.